The Stand Up Paddle racing environment, especially in the last two years, has evolved a lot. Athletes are increasingly better prepared, they do specific training to improve the technique of paddling and go faster than ever, demanding boards that respond to their demands in the water. No stranger to these questions, the Fanatic development team was working in collaboration with its top rider, the French Arthur Arutkin, until obtaining a new range of race boards that suits to the needs of all those SUPers who want a board that gives them the maximum performance in competition. In this way, the Austrian brand has created the new Blitz model, and has completely redesigned the Falcon and the Strike models. 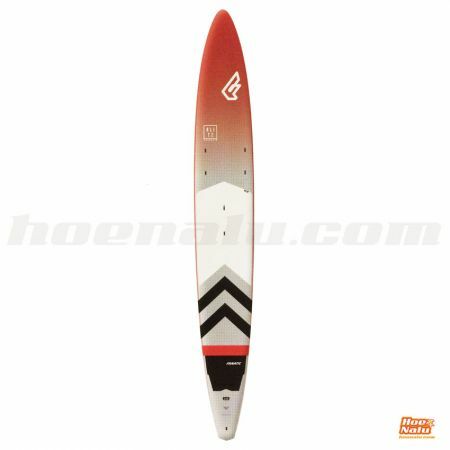 The first is designed as an easy board that adapts to any water condition, the Falcon is the board for downwinds and hard conditions, and finally the Strike is the option for flat water. 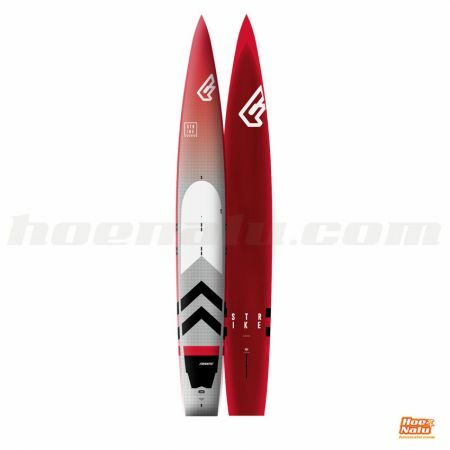 The latter is the one we analyzed in this week's post, because the 2019 model has been a complete metamorphosis of this board if we compare it with its predecessor, and implies an evolution in the concept of flatwater boards, which can be used in any condition, increasing the speed considerably, thanks to its renewed design. Discover the new Fanatic Strike 2019 in its two sizes: 14'x21.5" and 14'x25" a very important option if you are thinking about changing your competition board or want to start in the SUP racing environment. Strike: increase the speed, lower the weight. 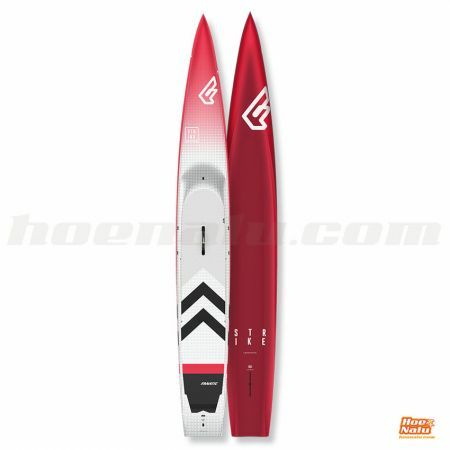 The Strike, as we have said, is the Fanatic flatwater board for 2019 but completely redesigned. The main difference in the first eye contact, and that most striking, is the new design of the nose, which has been reversed with respect to the previous model, improving the way that the board affects the water. 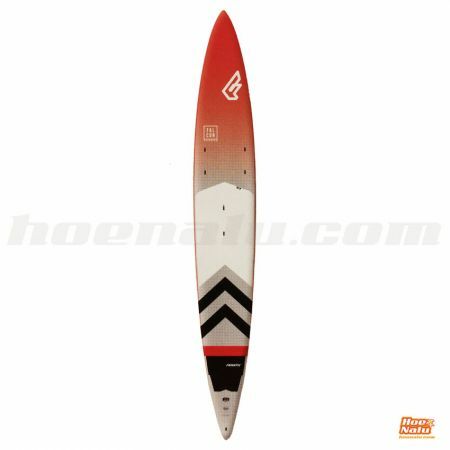 This board is a speed machine of the Austrian brand and is offered in two widths, the 21.5" that we can say is a 100% flat water board and the 25", that despite being designed to offer the maximum flatwater performance can also be used in any water condition thanks to its width and shape. Fanatic uses the CCS (Custom Carbon Sandwich) technology for its competition range, a construction that allows maximum lightness thanks to the innegra carbon, which is a high-end material with balanced weight, resistance and impact features. It also offers a fantastic dynamic flex thanks to the use of thin layers placed in sandwich mode, one over the other, so that it provides an optimized response to the force and tension applied in each stroke. The rails are reinforced in carbon as well as the bottom and the tail, the most sensitive areas of the race boards. The bottom has a large concave that is accessed from a central channel, which improve the advance of the board, opening the way in the water. 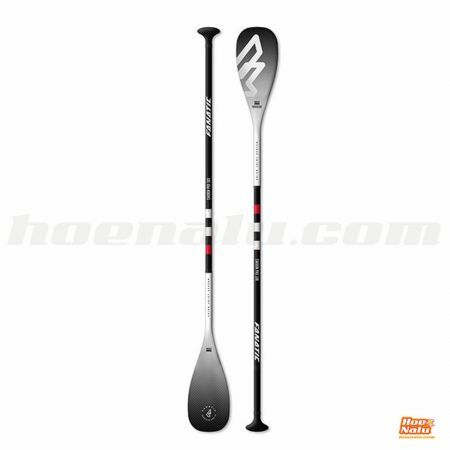 It has two catamaran-type side supports that reduce friction and increase speed , so that once you get on the Strike and give your first strokes, you will notice that you advance faster. This shape makes both measurements surprisingly stable, so if you were using a 24" board you will comfortably go to 21.5", and if you sail in a 26" habitually, the change to 25" will not be an effort, with the consequent increase in speed when reducing the width..
With a volume of 274 liters, the 21.5" can be a very narrow input for what we usually handle in raceboard widths, but thanks to the redesign of Fanatic and the shape created especially for flat water conditions, the Strike increases its stability despite its short width considerably. You will have the feeling of riding a 24" but with the efficiency of a 21.5" in terms of speed. The recessed deck of this model is deep, to lower the center of gravity of the rider, with a high tail that prevents the entry of water and with holes to drain the water that could be stuck in it. This raised tail helps considerably to lift the nose of the board and make the buoy turn, since it improves the lever when it comes time to turn. The width of 21.5" with the bathtub so deep, makes the feet have a defined position, with little choice to move in conditions of completely flat water you will see how to increase the speed, improves the performance since all the design of the bottom enters at play, and this causes the speed to shoot up when the board is balanced and all the elements act as they should, since the inertia increases a lot, so the changes on the side of the paddle do not suppose a deceleration and the board allows to paddle many times on the same side thanks to its features. When it is choppy, the Strike 21.5 " behaves in different ways, facing the waves it shows that it has a nose for flat, so navigation is less comfortable, when the wave reaches us sidely, is when you feel that you are on a narrow board, and although the board is sailing well, the behavior will depend to a large extent on the characteristics and expertise of the rider. Finally, when the waves come from behind, pleasantly surprised how the Strike surfs, since the nose does not get to sink into the water, and it is easy to keep the board surfing the waves, besides the elevation of the tail, prevents the bath from flooding. The truth is that when I saw that Fanatic was getting the Strike model in 21.5" I thought it was quite risky. In 2018 I have been using Strike 14'x24" and I noticed that I had no spare width. However, as soon as I saw the new one, I felt that it had to be much more stable than the measures reflect. The first day I went out to paddle with my brother, we both agree that despite being 21.5", it is very stable. The big difference with the previous one is that you have to adapt to go "boxed" in the bathtub, otherwise, it is a board that allows many mistakes The first test was in "its environment", inside the harbor, no wind and water like a mirror. In these conditions the board is perfect, takes a lot of inertia and does not need a great stroke rate to maintain a good speed, getting in addition to just deviate by paddling only from one side.The turns, although you have to adapt by the step that has in the tail, are very easy because of the width of the stern. The next day I could try it in more difficult conditions. At first, despite not having a wind, we had a good sea bottom with a side wave for the first kilometers. There you can feel how narrow it is, even so, no fall (despite saving a few) and good speed. When turning, doing about 3 kms with wave in favor and without wind, the board flew, took the bumps very well and you feel increasingly confident and stable as you begin to understand how to manage the board. Perhaps the section that surprised me the most was the return, side wave again and crosswind (fairly soft). In those conditions, when I thought that it would be more difficult, the board stayed very stable and above all it maintained the speed very well. I have not been able to try it more but I can say that it is a much more accessible board than it seems. In my opinion, whoever is using the 14'x24" previously, can go with this without problems, although it needs a period of adaptation because it is very different. . The Strike 14'x25" can be the option chosen by many riders as the versatile board with which to face the diversity of conditions that gives us the sea.The 25" version of the Strike is a board that despite having a shape design to optimize the navigation in flat water, it can be used in any water condition, obviously if you live in a place where the usual conditions are quite moving, it is not the ideal board although it would be worth it, but if you are a rider that sails in quieter conditions, this one can be your board for everyday, surprising your performance both in flat and in other conditions thanks also to its 295 liters of volume. It has not recessed deck than the other model so it does not need to incorporate the drainage system of the previous one, and allows more mobility on it, so that it is easy to face conditions in which the position of the feet to counteract the waves. Both Strike stand out for offering a minimum resistance when they move through the water, obtaining the maximum possible performance. This 25" model with the new nose leaning forward and with the necessary volume to keep it above the waterline in case of immersion, opens the way at sea with an amazing speed and boosts the performance of each stroke. A generous tail counters the narrowness and provides extra stability, giving the feeling that you have a wider board so it is a highly recommended option for riders who are using a 14'x26" and want to increase speed without compromising stability on the board. Without a doubt, the Strike is the board for those who want to go faster and who paddling usually in flat conditions or even with something choppy. They stand out for their speed and stability, you can decide for it or not, but what is certain, that if you test it, you will be surprised. In the following video you can see the analysis we did of the two Fanatic Strike 2019 that we have had in HoeNalu and that we have tested in different conditions. If you have it clear and want to buy a Fanatic Strike, you have the two models available in our online store: Strike 14'x21.5" and Strike 14'x25". If you still do not have it clear and you want to try one of them or both, you can contact us and make an appointment to try them in Marbella or nearby. If you have any other questions or need another complement to your race table, we will be happy to help you choose the best option.